Preparing for the Twenty First Century, Ch. 11, ‘The Erstwhile USSR and its Crumbled Empire’, pp. 249, Paul Kennedy (1993). Assessing Russia’s effective strength has been a problem for observers of the country since its inception. It’s a riddle, an enigma and a mystery all wrapped up in one, as Churchill wryly noted long ago, and that’s unlikely to change soon. In any case the paradigm has certainly held these past fifteen years since the Soviet disintegration. Since the 1998 financial crisis, the state has reasserted itself. The ostentatious oligarchs who flaunted their power in the 1990’s have been brought to heel and what Kremlin ideologists call a ‘power vertical’ has been established in politics. Growth since then has been around 7% per annum, returning the economy to Soviet peak levels of output by around 2003. Poverty has been slashed and the middle class has exploded, attested to by impressive increases in such areas as car and mobile phone ownership, Internet penetration and living space. Rising oil prices permitted the cancellation of most debt obligations and the creation of gigantic foreign currency reserves; yet since 2003, consumption and more recently investment have played an increasingly significant role. Indeed, the idea that the Russian recovery is due entirely, or even mostly, to high oil prices is a myth – indeed, production has been more or less stagnant since 2005 in the hydrocarbons sector. Retail, construction and late manufacturing have been the key drivers of growth – like in the Baltics or neighboring CIS countries. Big Western firms such as Peugeot, Toyota and Mitsubishi are building up production capacity in Russia. The government is starting moves to diversify the economy by pursuing investment in ‘national priority projects’ (education, heath, housing and agriculture) and targeted investments into ‘strategic industries’ like aircraft and space, shipbuilding and nanotechnology. Statistics are, overall, probably the most objective reflection of life in a country. Some dipped in the 1990’s (like life expectancy), but practically all have become better in the 2000’s. Since the early 1990’s, access to tertiary education has been steadily increasing – in 2006/7, three times more students enrolled into college than in 1993/94. Today, Russia has the world’s most educated 25-34 year olds, which bodes well for the future hi-tech economy. The outlook in public health is mixed. Infant mortality, after remaining generally flat in the 1990’s, has tumbled by nearly half since then, reaching 10.2 deaths / 1000 births in 2006. Life expectancy, on the other, fell down and stayed down. 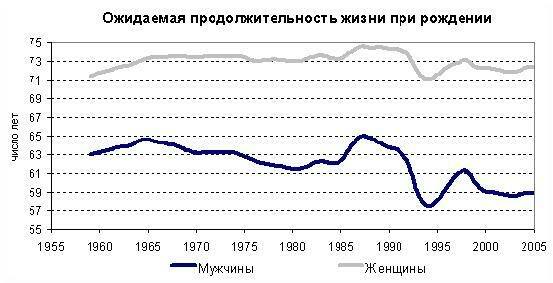 As you can see, life expectancy in the Soviet Union approached that of the West in the 1950’s, but stagnated soon afterwards at 65-70 years. Gorbachev’s anti-alcoholism campaign in the late 80’s lifted it, but it collapsed with the fall of morale and corruption in healthcare that appeared in the 1990’s. An incipient recovery in the mid-90’s was cut short at around the time of the 1998 financial crisis. The causes of this, however, are above all of a social rather than developmental character – deaths are concentrated amongst middle-aged men, who have some of the world’s worst stats on smoking and alcohol abuse, and exacerbated amongst all social groups by a poor diet. Hence alleviating their plight by relatively cheap public health measures (like anti-smoking propaganda) is a priority measure, which the state has yet to take seriously. Nonetheless, there is evidence of a turnaround sometime around 2005. The mortality rate / 1000 people, which had been rising inexorably from 12.2 in 1992 to 16.4 in 2003, has since fallen to 14.7 in 2007. Deaths from heart disease continue to be unacceptable high (several times the rate in Western Europe), though there has begun a sustained fall from 2005. Most encouraging, violent and/or nihilistic forms of death have fallen – from 2002 to 2007, the incidence of death from suicide, murder and alcohol poisoning has fallen by a fifth, two-fifths and more than half, respectively. The statistics are still unacceptable, of course – for instance, the murder rate is still three times higher than that of the US and 5-20 times as high as in most European countries – but the trend is encouraging. The demographic Russian Cross is being flattened by two other forces – rising birth rates and immigration. 2007 saw a post-Soviet high of 11.3 births / 1000 from the nadir of 1995-2002. Meanwhile, the year also saw a great increase in migration to Russia. (In the 1990’s, it was driven by influxes of ethnic Russians stranded in the Near Abroad. 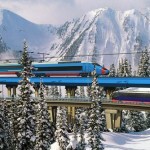 Now, they are composed by Gastarbeiters – Russians have borrowed the German term – from the Caucasus and Central Asia). 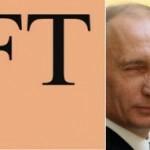 Indeed, totaling up the figures would give a rate of population increase in 2007 in Russia of around -0.15%. This is not substantially different from Japan (-0.09), Germany (-0.03), Poland (-0.05) or indeed just about any other central-east European country. While the levels of immigration are limited by political considerations, the trend towards higher birth rates is real and can probably be sustained. This is because the desired amount of children generally doesn’t equal the amount people are willing to have due to economic considerations, according to this study; presumably, continued economic progress will raise birth rates up to 2015. This is not to say that Russia doesn’t have problems – it does. For a start, as pointed out, health statistics on mortality, particularly heart disease, are unacceptable compared to Western Europe. Nonetheless, doomsday talk of a demographic death spiral is just that – hogwash. Furthermore, in economics, what matters isn’t the population or its growth rate per se, but the dynamics of the working age population as a percentage of the whole population – the dependency ratio. More people working generally translates into more wealth and a more stable pension system. 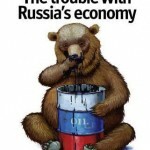 According to Goldman Sachs (Dreaming with BRICs, pp.8), from 2005 to 2030 it will decline from 67% to 60% in Russia, compared with a similar decline in China and with a 62% to 54% decline in the G6. Hardly apocalyptic. Then there’s the problem of corruption, which according to think tanks like Indem (bribes are 2.5 times bigger than the state budget) and Transparency International (Russia is wedged in between Indonesia and Togo in the Corruption Perceptions Index) is out of control in Russia. While there’s no denying Russia is plagued by corruption, to suggest it is endemic like in a failed state is ludicrous – and would frankly be obvious to anyone who has visited the countries on that list. The problem with the CPI is that it’s a survey of outsider businesspeople and their subjective perception of the situation. While improving perceptions is an important goal, it does not necessarily correlate perfectly with reality. TI’s Global Corruption Barometer asks ordinary people how affected they are by corruption, for instance, have you paid a bribe to obtain a service this year? In 2007, 17% of Russians did – putting them into the same quintile as Bulgaria, Turkey and the Czech Republic. In other words, slap bang in the middle of world corruption, rather than at the end. One of the themes the Western media constantly harps on about is the Tsarist-like concentration of wealth in the hands of the few and the misery of the downtrodden majority. But let’s look at the facts. The standard economic measure of inequality is the Gini index – the higher its value, the greater the inequality. Russia in 2005 got 40.5 (1988 – 23.8, 1996 – 46.2, 1998 – 44.4, 2000 – 45.6, 2002 – 39.9, according to the World Bank). Hence the reasonable thing to conclude would be that it rose precipitously soon after price liberalization and has remained at a range of 40-45 since. While high by the standards of the European Union (31.6), it is roughly comparable to Japan (38.1), the US (45), China (46.9) and the Baltics (35-37) and considerably lower than classic examples of unequal countries, like Brazil (56.7), Argentina (48.3) and South Africa (57.8). Furthermore, unlike China, ethnically Russian areas in Russia (80% of the population) are relatively homogenous in wealth – remove areas skewed up by oil profits (parts of Siberia), backwards non-Russian areas (Daghestan, Chechnya, Buryatia, etc) and you get another Poland (34.5). Westerners tend to paint Russia on a big canvass – it is either some kind of evil empire, secret-police state or really, really, weak. (The latter article I really don’t recommend). But Russia rarely fits onto a pre-conceived sketch. It possesses an almost elemental resistance to definition and understanding. In other words, why not just cut out the fancy framework with Occam’s proverbial razor, reject hyperbole and Orientalism when analyzing ‘exotic’ foreign cultures and accept that Russia is a normal country – as has already been argued by Andrei Shleifer and Daniel Treisman in Foreign Affairs in 2003. The next article will be entitled ‘Towards a New Russian Century?’ and will continue with the themes posted here, albeit with more focus on future trends from a global perspective. Edit: by an amazing coincidence, I discovered there already exists an article on the web called Reading Russia Right by Dmitri Trenin. Quite a good one, too.